An international team of scientists, including an ESF professor, has discovered that a large, commercially important fish from the Amazon Basin has become extinct in some local fishing communities. The team compared mainstream bioeconomic theory - which policymakers have depended on in order to protect fish populations - with the lesser-known "fishing-down" theory, which predicts that large, high-value, easy-to-catch fish can be fished to extinction. "Bioeconomic thinking has predicted that scarcity would drive up fishing costs, which would increase price and help save depleted species," said study leader Leandro Castello, assistant professor of fisheries in Virginia Tech's College of Natural Resources and Environment. "If that prediction were true, extinctions induced by fishing would not exist, but that is not what has happened." The research was conducted with arapaima, a 10-foot long fish that can weigh more than 400 pounds. "Arapaima spawn on the edges of floodplain forests and come to the surface to breathe every 5 to 15 minutes, when they are easily located and harpooned by fishers using homemade canoes," said Caroline C. Arantes, a doctoral student in wildlife and fisheries science at Texas A&M University and an expert on fish biology and fishery management. The giant fish dominated fisheries in the Amazon a century ago, but three of the five known species of arapaima have not been seen for decades, said Donald J. Stewart, an ESF fisheries professor who recently discovered a new species of arapaima. The research was based on interviews with 182 fishers in 81 communities who were selected by their peers as being experts and on fish counts in 41 of the fishing communities, accounting for 650 square miles of floodplain area. The results indicate that arapaima populations are extinct in 19 percent of communities, depleted (approaching extinction) in 57 percent, and over-exploited in 17 percent. The results are reported in an article (link) in the (date) issue of the journal Aquatic Conservation: Freshwater and Marine Ecosystems. "Fishers continue to harvest arapaima regardless of low population densities," said Castello, an expert on tropical fish, fisheries, and conservation. The good news is that in communities that have implemented fishing rules, imposing minimum capture size and restricting gill-net use, for instance, density of arapaima is 100 times higher than where there are no rules or the rules are not followed, said David G. McGrath of the Earth Innovation Institute in San Francisco. "These communities are preventing further arapaima extinctions," said McGrath. "Fisheries productivity in Ilha de São Miguel is also the highest in the study area," said Castello. "Cast nets are allowed because they are much more selective yet they yield abundant fishes for local consumption, so food security for the community is not compromised." "Because tropical regions suffer from widespread illegal fishing and a lack of data, these findings suggest that many similar fishing-induced extinctions likely are going unnoticed," he continued. "There is also a lack of economic alternatives for the fishers." But the experience in Amazonas State, Brazil, shows that things can be different. 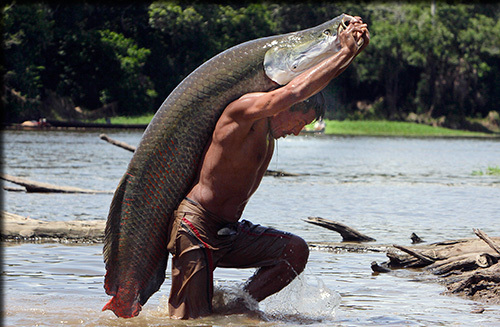 "Many previously overexploited arapaima populations are now booming due to good management. The time has come to apply fishers' ecological knowledge to assess populations, document practices and trends, and solve fisheries problems through user participation in management and conservation," Castello concluded. Fabio De Souza of the nonprofit Society for Research and Protection of the Environment in Santarem, Pará, Brazil, is developing and implementing community management for arapaima in the region. "There is willingness among fishers to implement management, but our efforts require more support from governmental agencies," De Souza said.